It might be tempting to pull up to the drive-thru window to fill up on food and coffee on frosty winter mornings, but some Canadian communities are arguing that traffic safety and concern for the environment should trump convenience. At some popular fast-food restaurants across the country, lineups are so long they stretch out of parking lots and spill onto public streets, and politicians are eyeing the emissions spewed by all the idling cars, trucks and sport utility vehicles. In London, Ont., civic leaders are considering restrictions on existing drive-thrus to try to clear the air. A citizens’ advisory committee is also recommending a moratorium on new drive-thrus, although the mayor is trying to strike a balance. "I don’t support a ban or a moratorium on drive-thrus … but if there are ways in which we can improve the air quality in ways that I can’t imagine at this point, I’m really open to looking at that and seeing if we can strengthen our bylaws," Anne Marie DeCicco-Best said. London council is gathering public input on a range of options, from banning new outlets to tightening zoning bylaws to make more areas of the city drive-thru-free. City staff have floated the idea of restricting the hours of operation for drive-thrus, and a decision is expected in the new year. In Hamilton, where Mayor Fred Eisenberger describes himself as "reasonably anti-drive-thru," council is studying an environmental group’s call for a moratorium on new drive-thrus. In Kings County, N.S., one politician has argued that only people with decreased mobility should be entitled to get their food while in their vehicle. "I think a pregnant mom or a disabled person or a person who couldn’t get out of their vehicle or an older person, they could use the drive-thru," said Wayne Atwater. "But these people that are able-bodied men and women, I certainly don’t see any reason why they can’t get out of their vehicle." Mr. Atwater pushed for a moratorium on new drive-thrus last winter, citing concerns about carbon monoxide and traffic problems, but he couldn’t persuade his council colleagues. Students at the University of Alberta monitored a popular Tim Hortons outlet in Edmonton last year for 54 hours and counted 3,756 vehicles idling for an average of more than five minutes each. The longest idle was more than 12 minutes. Tim Hortons’s drive-thrus tend to generate the most attention because of their popularity. In Winnipeg, cars spill out of Tim’s lots onto such major thoroughfares as Portage Avenue and St. Mary’s Road as drivers queue up for a java jolt. "They’re victims of their own success," said Winnipeg Councillor Mike O’Shaughnessy. "You can see 15, 16 cars in line at 3 in the afternoon or 7 in the evening." Winnipeg has rejected two proposals for Tim Hortons this year, one because it would have interfered with a driveway of an adjacent business. the other because nearby residents expressed concerns about traffic. But Mr. O’Shaughnessy said those were individual cases and Winnipeg has no plans to crack down on drive-thrus. Tim Hortons says it has taken steps to reduce drive-thru lineups, such as allowing motorists to use credit cards that don’t require signatures. Many drive-thru work stations now have their own coffee maker and other equipment, so attendants don’t have to walk to another part of the shop to fill an order. The company also says it meets or exceeds space requirements in city bylaws. "I don’t support a ban or a moratorium on drive-thrus … but if there are ways in which we can improve the air quality in ways that I can’t imagine at this point, I’m really open to looking at that and seeing if we can strengthen our bylaws," says Anne-Marie DeCicco-Best. In Hamilton, Ont., where Mayor Fred Eisenberger describes himself as "reasonably anti-drive-thru," council is studying an environmental group’s call for a moratorium on new drive-thrus. Talk back: Could you do without drive-thrus? "I think a pregnant mom or a disabled person or a person who couldn’t get out of their vehicle or an older person, they could use the drive-thru," says Wayne Atwater. "But these people that are able-bodied men and women, I certainly don’t see any reason why they can’t get out of their vehicle." Atwater pushed for a moratorium on new drive-thrus last winter, citing concerns about carbon monoxide and traffic problems, but he couldn’t persuade his council colleagues. Communities from Toronto to St. John’s, Nfld., have taken steps to ensure that drive-thrus are far from certain residential streets or big enough to fit a long lineup of cars. But it’s the increasing worry over greenhouse gas emissions that’s prompting a second look. Tim Hortons’s drive-thrus tend to generate the most attention because of their popularity. In Winnipeg, cars spill out of Tim’s lots onto such major thoroughfares as Portage Ave. and St. Mary’s Road as drivers queue up for a java jolt. "They’re victims of their own success," said Winnipeg councillor Mike O’Shaughnessy. "You can see 15, 16 cars in line at three in the afternoon or seven in the evening." Winnipeg has rejected two proposals for Tim Hortons this year. One was nixed because it would have interfered with a driveway of an adjacent business. The other was axed because nearby residents expressed concerns about traffic. But O’Shaughnessy says those were individual cases and Winnipeg has no plans to crack down on drive-thrus. "We’re not against Tim Hortons. We’re not against drive-thrus," said O’Shaughnessy. "They’re very popular." The company also says it meets or exceeds space requirements in city bylaws. "We tend to find sites that are a little bit larger so we can accommodate a big parking lot and have a larger than required drive-thru," said Tim Hortons spokesperson Rachel Douglas from the company’s headquarters in Oakville, Ont. "(Drive-thrus) are almost becoming a bit of an essential service. You have parents with young children, you have elderly people with mobility issues. We find that our customers are wanting drive-thrus and are using drive-thrus and that’s really what’s behind the demand." Coffee shops, fast-food restaurants, banks and now liquor stores; they all have jumped on the band wagon and added drive-thrus to their establishments in the last decade. Was the invention a convenience for the consumer in an ever-changing fast-paced world or a brilliant marketing tool to increase sales? Whatever the reasoning, it worked. At any one time there are at least ten vehicles lined up at several of the drive-thrus in Grand Falls-Windsor. Things are different these days than in our grandparents’ world. There is more access to transportation, more households have two parents working and more and more teens are using mommy and daddy’s vehicles after school and at night. Thus there are more people on the run and more people using the convenience of drive-thrus. Despite the popularity of drive-thrus, more Canadian cities and towns are embarking on anti-idling campaigns, trying to pass bylaws banning these fast-operating lines. You can’t argue that idling cars emit potentially harmful greenhouse gases into the air. 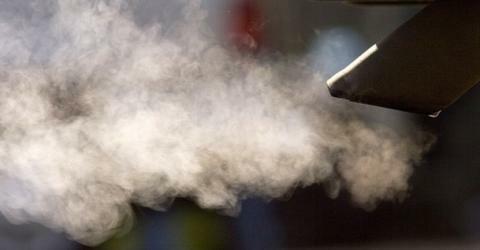 In fact Natural Resources Canada reports that an idling car can release up to twice as many exhaust fumes as a moving car. It also states that studies have shown a direct link between contaminants in vehicle emissions and significant respiratory health effects. The department also revealed that ten seconds of idling uses more fuel than restarting the engine and that if every Canadian driver avoided idling for five minutes per day, it would prevent 1.6 million tonnes of carbon dioxide from being emitted into the atmosphere. One lobby group known as the Council of Canadians, in London, have launched an online petition targeted at municipal, provincial and federal governments to ban drive-thrus in Canada. They are asking people to sign the petition, which demands that all levels of government impose an immediate moratorium on all new commercial drive-thru operations and establish a timetable to phase out all existing drive-thru operations through zoning or other by-laws. This is a new level of consciousness that is arising around the world in response to climate change. Banning drive-thrus is one way you can limit driver’s opportunities to idle their vehicles. In Grand Falls-Windsor some of the morning line-ups at the local coffee drive-thru are so long that they stretch out onto the street and this can cause a threat to public safety. However, town officials and the business are working on solutions – neither of them involve banning the drive-thru. Is it really necessary to ban them? The consequences mean more land will be needed to make bigger parking lots – thus more trees have to come down. And, more staff will be needed to serve the longer line-up of customers inside the store. This could be difficult as these kinds of establishments are already crying out for workers here in Newfoundland and Labrador as a result of the exodus of our young people to Alberta. The ultimate outcome could see these businesses closing their doors. Hopefully those out there addicted to coffee won’t have a problem with it. They’re fast, they’re convenient but are they environmentally friendly? Drive-thrus have become a way of life in car conscious Toronto, as busy GTA residents find they don’t have the time to even get out of their vehicles for a coffee or a hamburger. But what are they doing to the environment and how would you feel if local politicians made a move to either curb them or eliminate them altogether? Merella Fernandez has a look at that prospect on CityNews at Six. Until then, here are some other Canadian cities that are also considering slamming the window on drive-thrus. Hamilton: Considering stopping any new drive-thrus from being built in the city. London, Ontario: Restrictions may include moratorium on all new drive-thrus. Kings County, Nova Scotia: Pondering whether drive-thrus should be restricted solely to those with mobility issues. Winnipeg: Has turned down several proposals from Tim Horton’s for drive-thrus after residents complained about traffic issues and how they might block existing businesses. Download an MP3 of the entire program (22MB). Dr. Andrew Weaver, a climatologist in the Department of Earth and Ocean Sciences at the University of Victoria. Dr. Weaver discusses the changes in his home town, and how the climate models he works with predict our changing climate. Dr. Barry Smit, Professor of Geography at the University of Guelph and Canada Research Chair in Global Environmental Change. Dr. Smit studies how we might adapt to a changing climate and looks ahead to how the landscape and life of people in British Columbia will be transformed. Joan Klaassen, Meteorological Service of Canada, Environment Canada, Ontario Region. Joan Klaassen studies extreme weather, such as drought, ice storms and rainstorms, and looks at how a future with more of these events will affect central Canada. Dr David Barber, Canada Research Chair in Arctic System Science at the University of Manitoba. Dr Barber has studied Arctic sea ice for twenty-five years, and looks ahead to the future of the North, in which summers are entirely ice-free. Dr Murray Humphries, Assistant Professor of Wildlife Biology, and NSERC Northern Research Chair at McGill University in Montreal. Dr Humphries discusses how terrestrial animals adapted to cold northern climates will be affected as their environment warms. Dr Jeremy Kerr, Department of Biology, and Canadian Facility for Ecoinformatics Research, University of Ottawa. Dr. Kerr has been studying how ecosystems and biodiversity, particularly in Canada’s south, already stressed by human encroachment, will be further pressured by climate change. Linda Mortsch, Senior Researcher with the Adaptation and Impacts Research Group, Environment Canada/University of Waterloo. Linda Mortsch has been studying water concerns in a warming climate, particularly in the Great Lakes. Dr. Dave Sauchyn, Professor of Geography at the University of Regina, Research Coordinator for the Prairie Adaptation Research Collaborative. Dr Sauchyn has been studying water issues on the Prairies, which are already important and will become critical as warming aggravates water scarcity. Dr. Allan Carroll, Research Scientist in Insect Ecology, Pacific Forestry Centre of the Canadian Forest Service in Victoria. Dr. Carroll has been studying the Mountain Pine Beetle outbreak in BC forests, and how a warming climate might make future outbreaks of pests and disease more common in Canada’s forests. Dr. Mike Flannigan, Research Scientist in the Fire Research Group, Canadian Forest Service, Great Lakes Forestry Centre in Sault Ste. Marie. Fire, too, is expected to become more frequent in Canada’s future, and Dr. Flannigan in interested in how this might affect Canada’s huge Boreal forest. Dr. Norm Catto, Department of Geography, Memorial University of Newfoundland. Dr. Catto has studied how climate change, including more variable weather, changes in ocean currents and sea level change will affect Atlantic Canada. As the world leaders meet in Bali to find ways to stem the global climate crisis Canada is making its voice being heard, but sadly it is not the voice of leadership but that of a laggard. In spite of mounting global criticism, the Government of Canada is opposing commitments for greenhouse gas reductions in Bali this week unless all major polluters such as China and India are treated similarly. In doing this, Canada has moved from being a quiet climate failure on the margins of multilateral negotiations to a roadblock to international progress. A key principle underpinning on-going negotiations is that ‘industrialized’ countries must make bigger pollution reductions, and must make them first. This principle has the successful precedence of the Montreal Protocol that worked to curb the atmospheric pollutants causing holes in the ozone layer. Nonetheless, the fact that some countries are being asked to ‘go first’ is something that is commonly distorted and amplified by opponents claiming it is unfair. There is a very good reason why industrialized countries like Canada and the United States are being called upon to make stronger commitments to reducing greenhouse gas pollution than developing countries – both historically and today we have had a grossly disproportionate role in producing them. If one believes in the principle of polluter pays then industrialized nations, which were responsible for the lion’s share of emissions already in the atmosphere and possess extremely high per capita emissions, must bear the onus of making largest reductions. Canada has been and continues to be amongst the worst per capita contributors to climate change in the world. With only 0.5 percent of the world’s population, Canada produces roughly 2 percent of the world’s greenhouse gas pollution. If negotiations were to equitably distribute the ‘safe’ amount of greenhouse gas pollution (as estimated by the Intergovernmental Panel on Climate Change) to each person on the planet, Canadians would need to cut our greenhouse gas footprint by well over ten times what we committed to in the Kyoto Protocol. Our current position is being framed with the language of ‘fairness’, while it seems to be asking China and India to be responsible for the same reductions as Canada, though the average Chinese citizen is responsible for only one-fifth as much pollution as the average Canadian, and the average Indian citizen one-tenth. The global inequality of greenhouse gas emissions grows yet further when we realize that climate change is not just a result of what we are emitting right now, but is the outcome of an accumulation of all of the greenhouse gases that have been released atmosphere. Therefore it is important to keep in mind that any settlement which does not factor in this historical imbalance will already be letting developed countries like Canada and the United States off easily. This is not to say that the emissions from China, India, and other fast-industrializing countries are not significant. In fact China’s absolute greenhouse gas emissions will soon overtake that of the U.S. (though the U.S. will still have vastly greater per capita emissions). So clearly, there needs to be a commitment which binds these countries to quantified, near-term actions. Having failed to even attempt to curb our emissions, we are left with very little credibility to demand action from others. By entrenching in a position that is completely unacceptable to developing countries such as China and India, Canada is doing little more than scuttling the debate. This is a prescription for inaction at a time when there is a broad scientific consensus that we need to prevent global temperatures from rising more than 2°C above pre-industrial levels if we are to prevent major and likely irreversible damage to our environment, economy and communities. Tragically, we also know that those who are most vulnerable to the worst of these impacts are found in the world’s poorest regions – those least responsible for the damage. Instead of writing real commitments down and working towards them, the Canadian Government proposed “aspirational” targets at the most recent Asia Pacific Economic Cooperation forum. The government has also regularly resisted committing to actual overall reductions in emissions in favour of what they call “intensity-based” targets, which means emissions can continue to soar on into the future. Unfortunately, the earth’s atmosphere will not react better if we merely aspire to change, or if we become more efficient polluters while the total volume of greenhouse gases continues to grow. The global community knows this and thus Canadians should not be surprised when the rest of the world refuses to take the government of Canada’s recent global warming grand-standing about ‘fairness’ seriously. Dr. Tony Weis is an Assistant Professor of Geography at the University of Western Ontario, in London, Ontario. Tim Weis, P.Eng., is a Senior Technical and Policy Analyst with the Pembina Institute, based in Edmonton, Alberta. Endorsements | Who Supports a Moratorium?